I was pretty excited to try out the MATE environment because it’s what I run on my Ubuntu machine. However, it boots into some gawd-awful mint menu monstrosity and only has one panel. I can always install another panel, of course. But I tried to install the menu bar (Applications, Places, System) except it shows up as a white blob on the dark default panel. 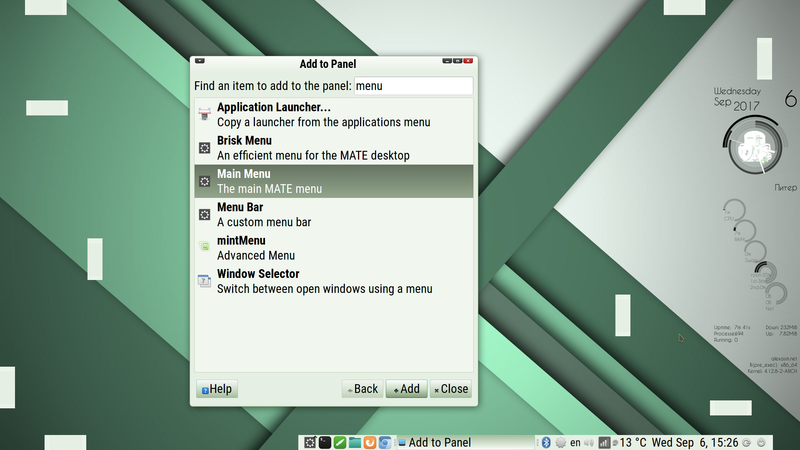 How do I get rid of that mint menu thing and get the standard Gnome 2-style menu to show up in the dark panel? Thanks. Choose whichever suits your tastes better. Or do not use a menu at all. Various docks work well. The number of panels in Antergos Mate is virtually unlimited. They may be placed anywhere on the screen. They may be attached to or detached from screen edges. They may be disposed horisontally or vertically. Each screen edge may have an unlimited number of panels. All panels are independent one from another. Each one can be freely configured according to personal preferences. This is Antergos Mate with 10 different panels. Any applet may be added to any panel.